If your personal security or that of your business has been compromised through hidden bugs, then you need to consider bug sweep services to remove the potential threats. However, just the thought of this is enough to raise a myriad of questions. Here are some of the most common, along with their answers. One of the most common questions is often ‘how can I tell if I’ve been bugged?’ Although there is no single way to tell, there are some signs to be on the lookout for, these include unusual sounds on your telephone, furniture being slightly out of place, changes in the settings on your computer, and unexpected visitors or gifts. Most individuals are also concerned about what they should do why a bug sweep takes place. Once you even think you have been subjected to any type of bug, you should firstly ensure that you do not say or do anything that gives away information in the affected building. Never assume it is just one room that is under surveillance. Use an unaffected phone line or computer to contact banks and other institutions that could be affected by any information that has been gathered, and change all passwords. Finally, most people also want to know what they should do with the information gathered from the counter surveillance sweep. The simple answer is to inform the proper authorities, and where needed, take legal action. If it is your home being spied on by a jealous ex-partner, then the police should take care of all of this. If it is a business matter, then you may want to deal with it slightly differently. Bug sweep services are at the heart of what is offered by Advanced Sweeping. We take your security concerns very seriously and have the necessary training and experience to give you peace of mind. 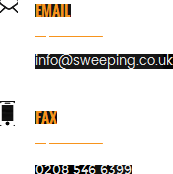 For more information, email us today at info@sweeping.co.uk or simply head to our website http://sweeping.co.uk/.